The World Amateur Champion is a handsome boxer from Russia who excels at outboxing and taking points, but adopts a vicious infighting style when he moves to Japan (Ippo notices how depressed he looks after this happens). 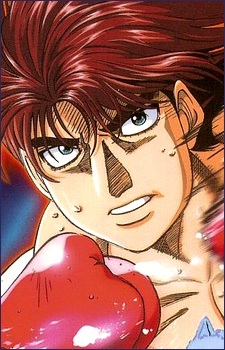 Raised by a single mother in a small town near to St. Petersburg, Volg originally takes up boxing in order to provide medical assistance for his seriously ill mom (who coincidentally looks a lot like Hiroko Makunouchi, but with longer and reddish hair), but after consecutive losses to both Ippo and Sendou, he is forced to leave the Otawa Gym and return to Russia, staying by his mother's side until her death. Besides his incredible outboxing technique, Volg's greatest weapon is a vertical combination called "White Fang" (a short, quick left uppercut, followed by an incredibly fast and powerful chopping right). Volg later returns to Japan to get his old boxing gloves from Ippo before he goes to America, and ends up helping Ippo train for his upcoming match against Sawamura Ryuhei. Later Volg went to America fighting at the world stage and, under the training of Dankichi Hama, became the 4th ranked IBF Jr. Lightweight fighter. His personality is very humble and polite, though he's a very good boxer, Volg admits that he doesn't really like boxing as it hurts other people (his coach even stated that his greatest weakness is his kindness that made him hold back in matches) but only does it so he can help his ill mother back home but finally comes to realize he has passion for boxing. There was also a running gag at the beginning, related to his rusty Japanese. When Ippo met Volg when he couldn't read kanji in the subway, and few minutes after their first conversation he got in trouble with other native Japanese people for the very same reason. In the world of boxing there are tons of different techniques that can secure victory. In Hajime no Ippo, main character Makunouchi Ippo utilizes the unstoppable Dempsey Roll.